The Arabian Sea crashes onto the white beach just yards away from us. Palm trees waving in the breeze, just like the ads. Who would give a thought to the tsunami which arrived here just a couple of years ago. What? I’d forgotten about that! After a hard trek through the length and breadth of India we arrived in Kovalam to rest up for a few days before returning home. Ah, the private beach, deserted except for a couple of sun beds and umbrellas. A discreet bar for drinks and snacks, a buggy to drive us to and fro, staff from our 5-star hotel to attend to our every need. Lovely. We settled down for a relaxing day in the shade. The Arabian Sea crashes onto the white beach just yards away from us. Palm trees waving in the breeze, just like the ads. Who would give a thought to the tsunami which arrived here just a couple of years ago. What? I’d forgotten about that! Forget it, there is a worldwide warning system in place now, isn’t there? Read your book. Just relax. Look out to sea from time to time. A couple of fishing boats are rowing around about 500m off shore. Very picturesque. A few hundred yards down the beach to the left there are a few men in short skirts desultorily hauling a rope, which goes straight out to sea. They haul in a little bit and make it secure to a tree. They sit and one of them waves to the boat. They sit a bit more and then they pull in a little more rope. There is a lot more sitting then hauling. A bit boring really. Our English neighbours on the next umbrella station are old hands in Kovalam. They have been here two years in a row. They tell us a bit of fishing goes on but it is all very low key. As they say this, we notice a very large group of men away to our right. They are quite far away but they also appear to be hauling a rope which extends out to sea. Another group of simple fishermen. This lot is much more animated then the first one. And there are many more of them. But now, when we check, the first group has grown too and the hauling seems a bit more urgent. We notice that the two groups are now hauling hard and are also moving towards us from both sides. They are still a long way away. We look out to sea and admire the view. When we check on the fishermen again we see that they have both come closer to us and are still hauling their net in. There are now very many of them. 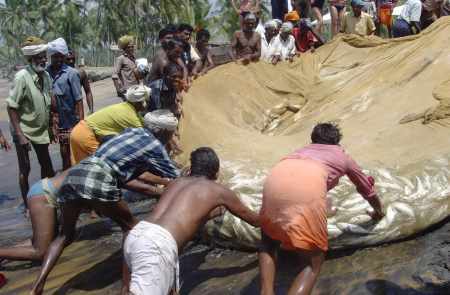 At this point we realise that they are not two independent groups hauling separate nets. They are actually one very large group hauling a very long net, which stretches from one side of us to the other. If they continue at the rate they are going it looks like the meeting point will be just about where we are sitting. The two sides are now two hundred yards apart and hauling frantically. The net is being coiled and carried along as they move towards us. Both sides are now chanting in unison. We can for the first time see the floats of the net stretching around in front of us from one side to the other. It is coming in rapidly. Some of the fishermen dive into the massive breakers and handle the floats so they don’t foul up the net. Excitement is growing as the net comes in. At this stage there are a few hundred men all hauling and chanting and shouting instructions to each other and coming through our private beach. They lift the massive nets over the umbrellas and take no notice of the tourists, some of whom are still trying to ignore the tumult around them. 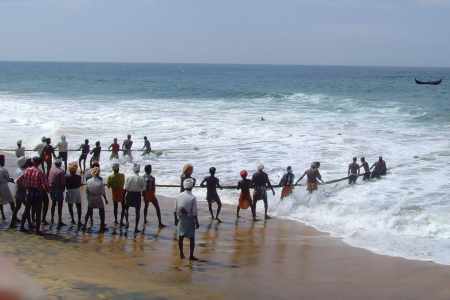 More men rush into the water to splash around in front of the net to keep the fish from escaping. The net keeps coming. It’s almost landed. The shouts take on an urgent excited sound, like a pack of hounds at a kill. The final effort to get the net out before the fish escape. 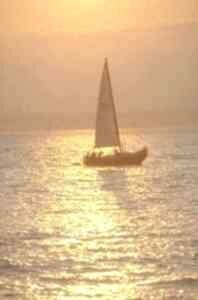 Men are up to their necks in the sea, breakers all over them but still they hang on and haul. And finally it comes out of the sea. It is huge. A good catch and the shouts change to yell of delight. Kids are scampering around leaping with excitement. The net is pulled and pushed up onto the beach. Some of the men clown about, acting out the parts they played to the crowd. There is a lot of good-humoured kidding and everyone seems to be happy. They rest for a short time and then the fish are loaded onto waiting trucks and carried off to market. Some of the men have taken a fish or two for their families. They all drift off in all directions. Just a little low-key fishing, then. We settle back down onto our sun beds. Now where were we? Ah yes. At peace. Kerala is well served with flights to Cochin and Trivandrum from all parts of India and the UK. Tourism is developed and buses and taxis are easily available and cheap. In fact it is essential to travel by taxi as no foreigner should even consider driving in India. We stayed in the Green Bay Resort Hotel, a very well run and luxurious 5 star Hotel which is 2 minutes from the sea by the buggies provided free by the hotel. 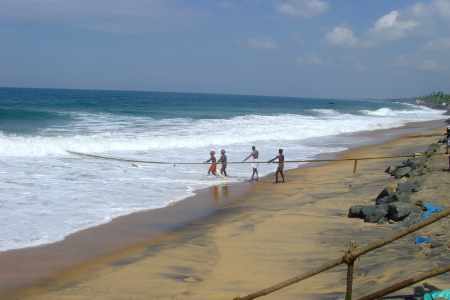 Kovalam is a nice resort town with plenty of good economy class hotels and restaurants. One of the great attractions in the whole of Kerala is the ancient Indian technique of ayurvedic massage which is available everywhere. So take advantage of it and have all yours wrinkles straightened out. It works; I can recommend it. If you enjoyed reading the above article then you will probably also enjoy Haridwar by John Gregan, and Borneo, also in Asia, and our latest articles covering the Orinoco Delta, La Mata, Marbella and Beijing.